My check engine light was on and my driver’s door handle had broken that morning. It refused to open as I left for Holden Village. Not a problem; I came in through the passenger side and crawled into the driver's seat. While turning the key and hearing the engine roar (or is that meow) to life, I grinned. Two years ago I was a financial adviser managing millions of dollars. Now I'm a photographer. While, obviously, I don’t have a nice car, what I do have is a lot of time to do whatever strikes my fancy. 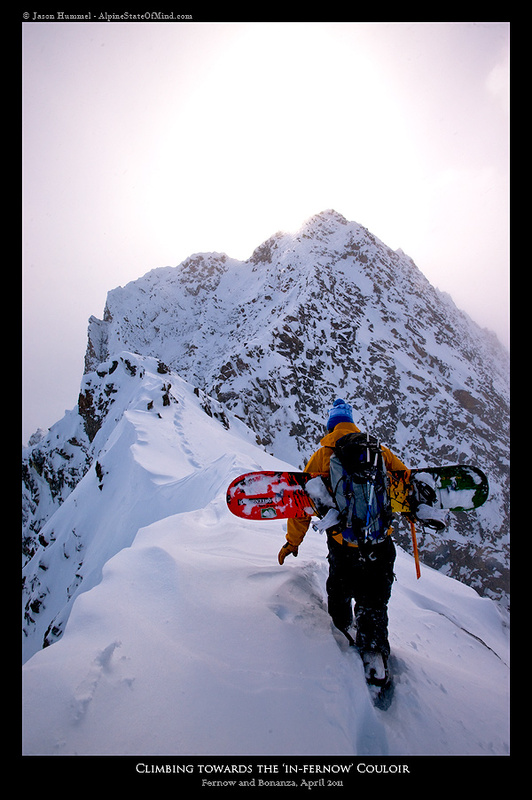 A few months before, Kyle Miller had proposed a trip to Holden Village after my previous adventure there (Bonanza, NW Buttress). Hourly studies of the forecasts did little to keep the weathermen honest. After weeks of this, it was decided that the-forecast-be-damned, we were going to the mountains anyway! While backing out of the driveway at 4:30 a.m., with an empty gas tank, I drove to the nearest station. After which, as I turned onto 30th street, I noticed my interior lights wouldn’t shut off. I pulled over to re-close all the doors. No luck – they were still on. My earlier grin turned to a smirk, “Now it's confirmed, I've become an honest to god, bona fide dirtbag”. Beat-up car: CHECK. Normally I wouldn't mention stopping at Kyle's parents house in Kent, but in this case the moment would be of consequence. While Kyle finished packing his stuff, I talked to his Mom while his Dad stood framed in the doorway. We didn’t know it then, of course, but this would be the last time Kyle would ever see his father alive. He closed the door and his mother walked back into the house a short time later. Paths had diverged. 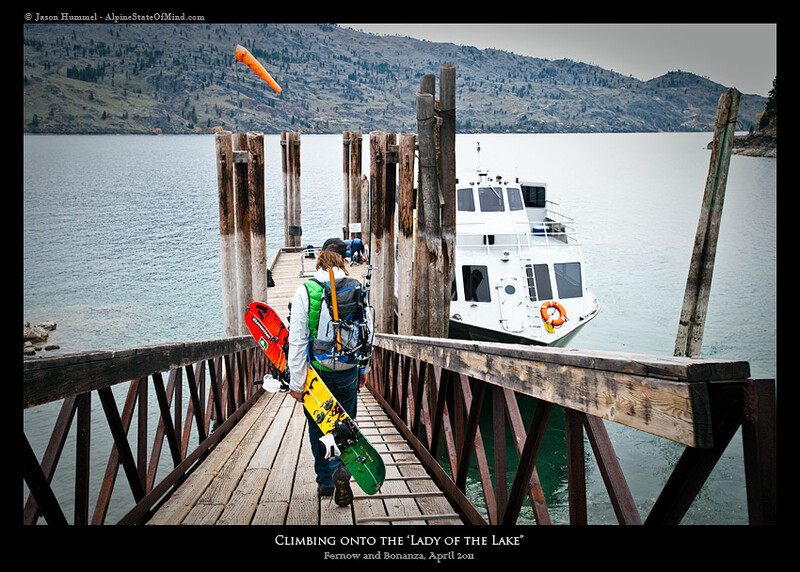 As we drove onto Highway 18, we headed east for Lake Chelan unaware of the future. The ferry would leave Field's Point Landing at 10:45; we would arrive an hour early. After catching the 'Lady of the Lake' and the 'Jubilee' bus to Holden Village, Kyle and I would settle into a quaint room. The following day we would get to work. At the time, big snowflakes were falling, dancing down gravity's elevator. Next to flames, falling snowflakes are the most mesmerizing to me. But on that first night, as I drifted off to sleep, I was equally cursing and cooing those snowflakes. I couldn't make up my mind whether I loved or hated them. Our first attempt was fraught with failure. Perfect skies deteriorated and it began to snow only a few hours into our day up Copper Creek. 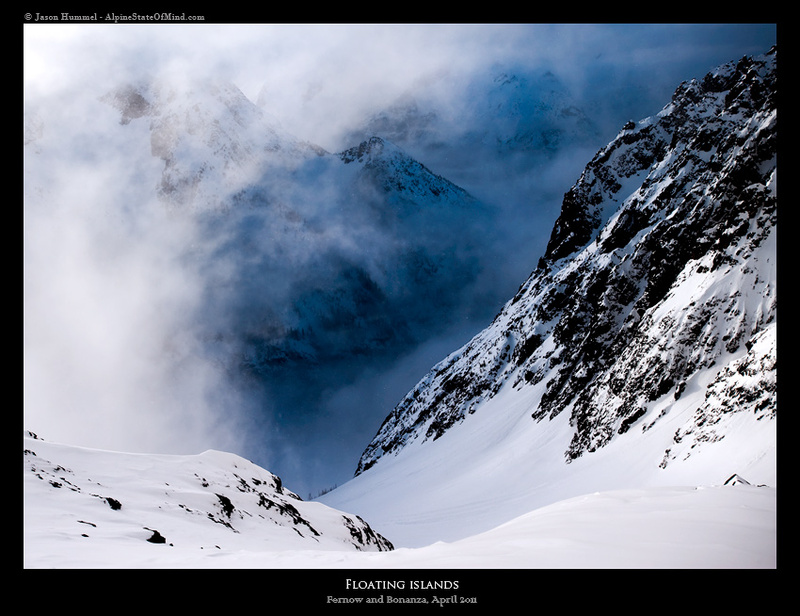 At perhaps 7000-ft on an unnamed glacier on the side of Fernow, in a cloud of swirling fog and snow, we called it off. Another day, we knew. For good measure and as a offering to the weather gods (and a token of my good faith), I decided to leave my tripod on the side of the mountain, a several hundred dollar offering! But, the question is, would she even notice it and would the following day live up to expectation. 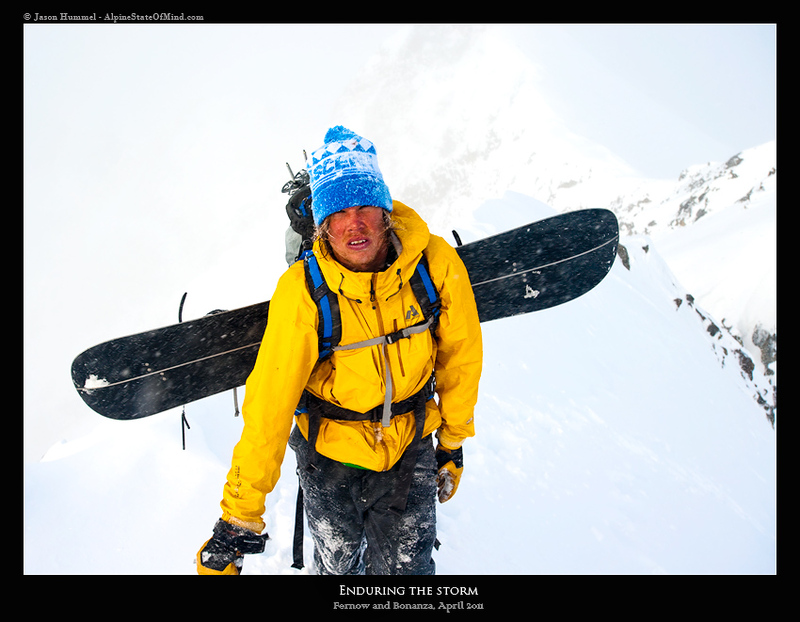 Only time could answer that (or for any and all armchair ski mountaineers, instead of time...just a few sentences, but be forewarned...bring a coat...oh, and sun glasses...err goggles; you may need them to weather the storm in the paragraphs ahead). Sometimes I wake up and forget where I am. This wasn't one of those times. First of all the bed was comfy and there wasn't any cars motoring by as there would be if I were sleeping at home. Lastly, there was an owl hooting; it did every morning. Besides which, it was perfectly silent. That is until Kyle and I began sorting and packing gear. Ice axes - yes. Rope - no. Beacon, probe and shovel - yes. So on. It appeared that the offering of my tripod to the snow gods the day before had worked, at least at first (cue sunglasses). Overhead, I couldn't help but smile as brightly as the afternoon sun I had dreamt about. But, and I hate to say it, "BUT" like a broken record or like my broken down car, our good weather was overrun by clouds (cue goggles). With their infiltrations came big flakes of snow, millions of which would shift in one direction and then, as suddenly, in another direction. Given the calm, but erratic wind, it was easy for me to be caught up by the show, to find myself staring as I mentioned I'm apt to do. Every time it'd take me a moment to remember where I was and what I was doing. "Oh, climbing. Yes, I'd better go." Eventually we passed our high point from the previous day. 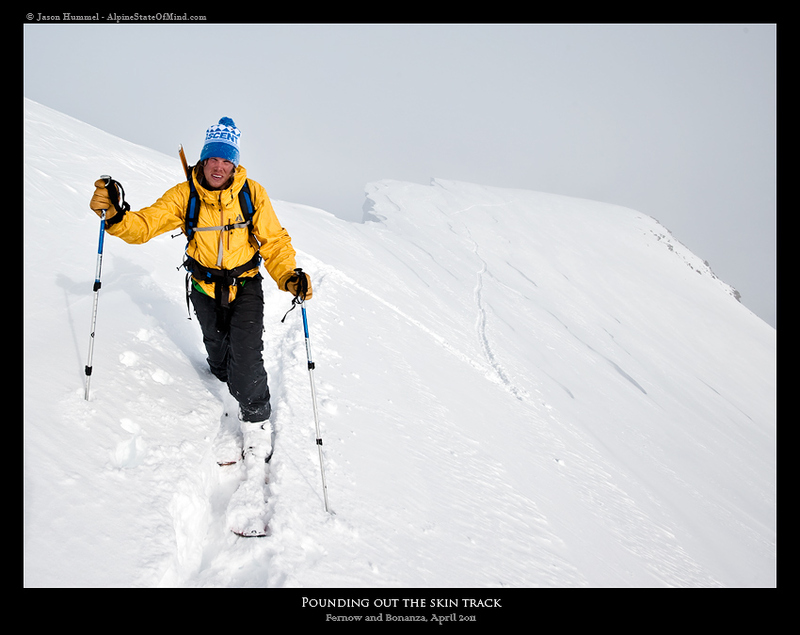 As much as it was satisfying, going beyond was made more interesting by the conditions and terrain. Even as I climbed onto the glacier, I had a hard time telling up from down in the fog. 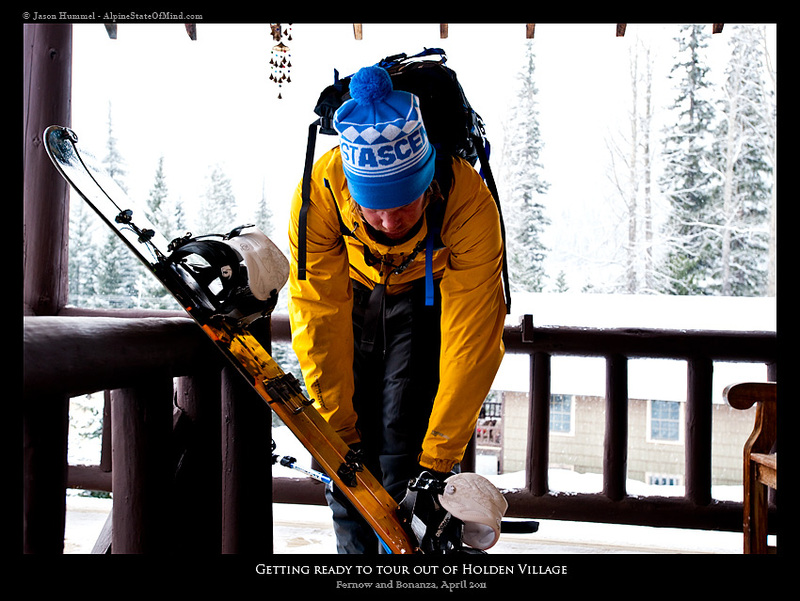 I flicked the snow using the basket of my ski pole to make heads or tails of what lay ahead. 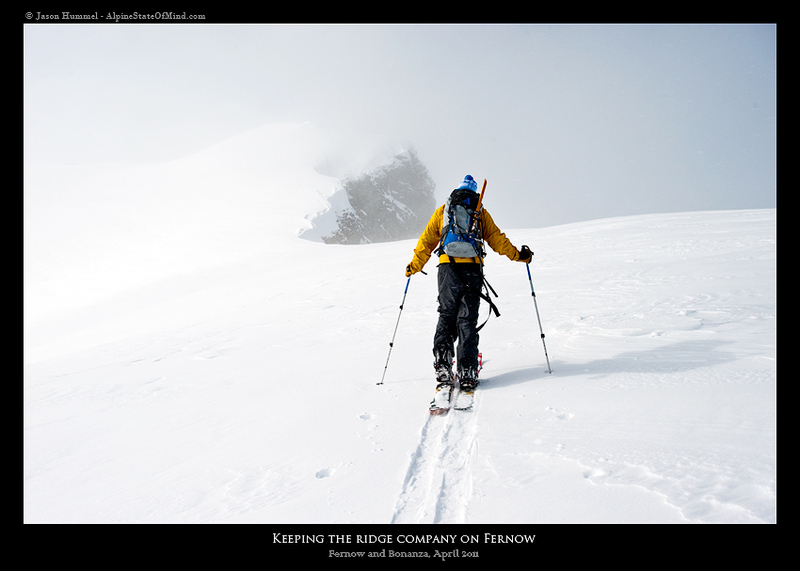 Every hundred feet or so I would push into the snow with my ski pole as hard as I could. Each time it would go all the way down. 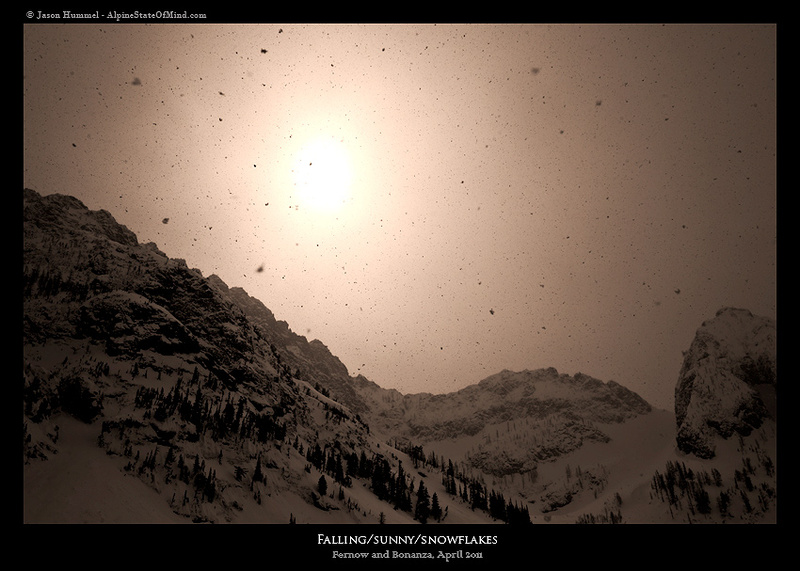 While the sun and blue sky coupled with it's warm rays were missed, it really was a godsend for us to only have had glances because the strong spring radiation would've made avalanche conditions very high, especially off the slippery rain crusts. As it was, we stayed far apart on the slope and continued to reassess the snow every few hundred feet. More than two hours later, we had climbed to a high point of the face. This is where the glacier converges with the southeast ridge. Had we been able to see, our eyes would've been held captive by the amazing north faces of Mount Maude and Seven Fingered Jack whose flutings of rock and snow lay jagged and jumbled for thousands of feet. What slight glimpses we did have had left us squinting for more, but we were denied our just rewards no matter how much we yearned for them. An excuse to return I would say. You always need to pocket as many of those as you can. Right then that's what I did. From the east face to the southeast ridge was spectacular climbing. As we mounted the northeast ridge an amazing couloir appeared on my left and to my right cliffs dropped three thousand feet. 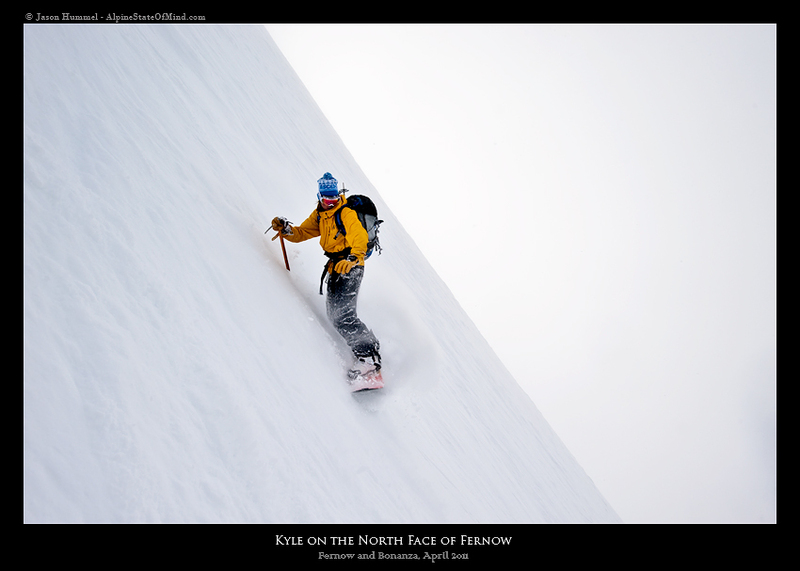 Leaving Kyle, I scouted ahead secretly looking for the entry to the North Face. 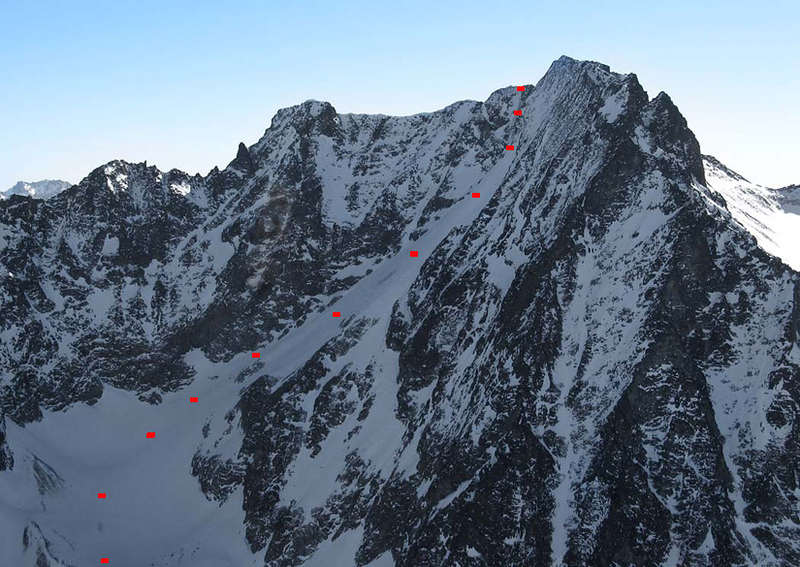 It has a tiny couloir that appeared, from John Scurlock's amazing aerial images, to access the North Face. As I traversed the narrow ridge, I was forced to descend, before re-climbing to the ridge top, and there, just as I had hoped, was the couloir. Kazam! When I looked behind, I could see Kyle making his way over to me. Through the fog, I was sure I could see the main face. That was good enough for me. "Are you sure it goes," Kyle pondered out loud at me? My answer was in the affirmative, but he's learned to doubt me, especially when I say, "It's all good," or "It's cake" or any such variation. That's Jason-speak for, "Dang, I hope that goes". Dropping in first, I set up for a picture of Kyle as he made his first turn. 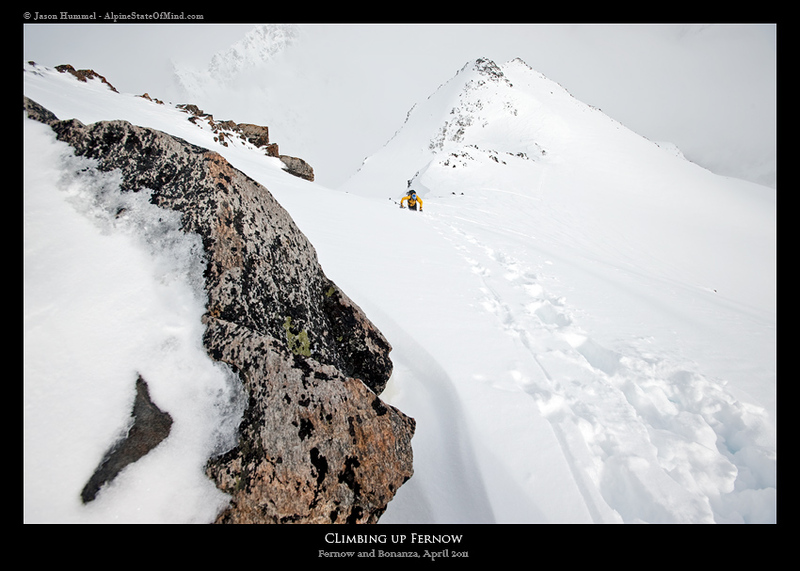 After he reached me, I took the lead and found just enough snow covering the rocks. On our left hand side were massive cliffs and to our right were slopping rocks. Further down I came to a steep roll which allowed access to the main face. Above me, Kyle asked if it went which forced me to grin and respond with a "It's all good". Of course he shook his head, but it was no laughing matter, just to me and my twisted sense of humor. Meanwhile, I traversed to the left of an icy runnel and ice-coated rocks to a very steep hanging snow slope below more massive cliffs. 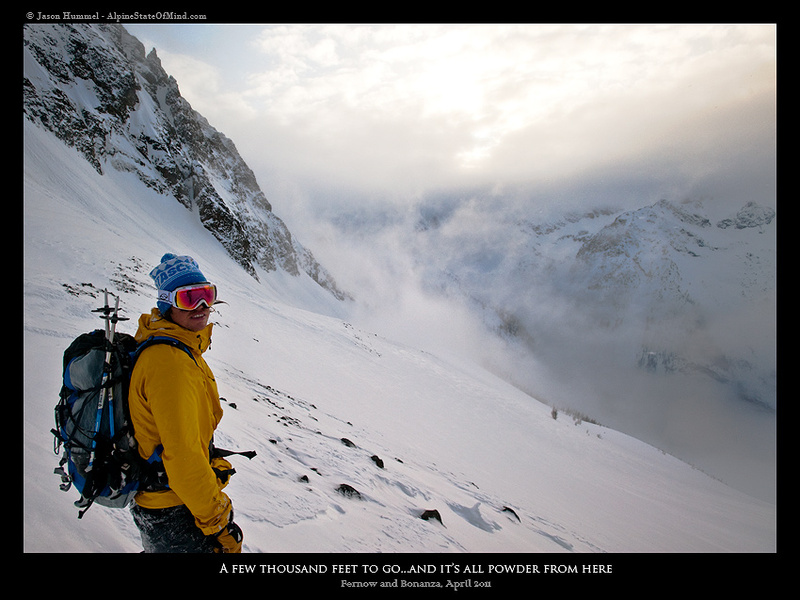 It was there I dug a hasty pit before calling Kyle down, telling him to ski lightly. He maneuvered his way to me, eventually boarding onto the wide open, fifty degree apron we had barely seen through the fog above. All optimism aside, I knew then that it was most certainly "...all good". 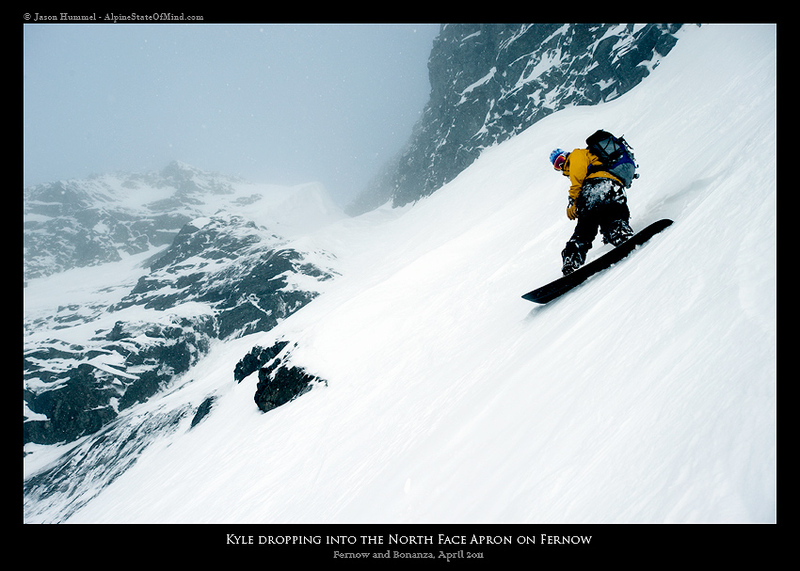 This was the point from which Phil Fortier skied in 2007. 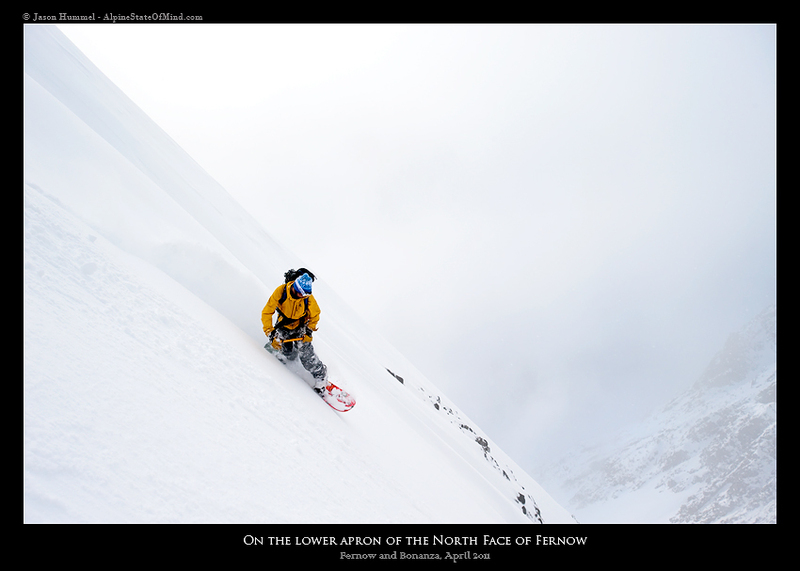 Now on the wide open face, I made several jump turns to further test the slope. Kyle then followed suit as we progressively near easier ground. 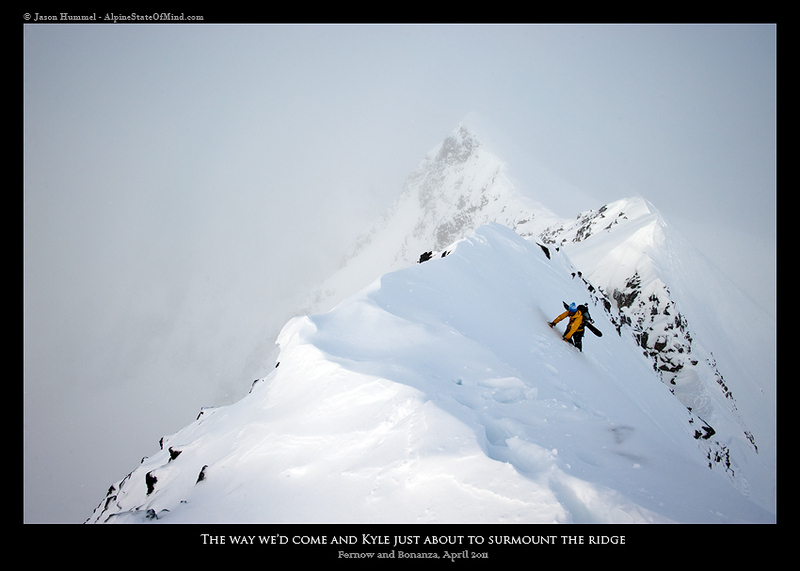 Looking back up at the short but steep couloir, I came up with an appropriate name. Back in Holden Village, a local had corrected me on the pronunciation of Fernow. In order to remember it, I'd always say "Inferno" in my head, since it rhymed. 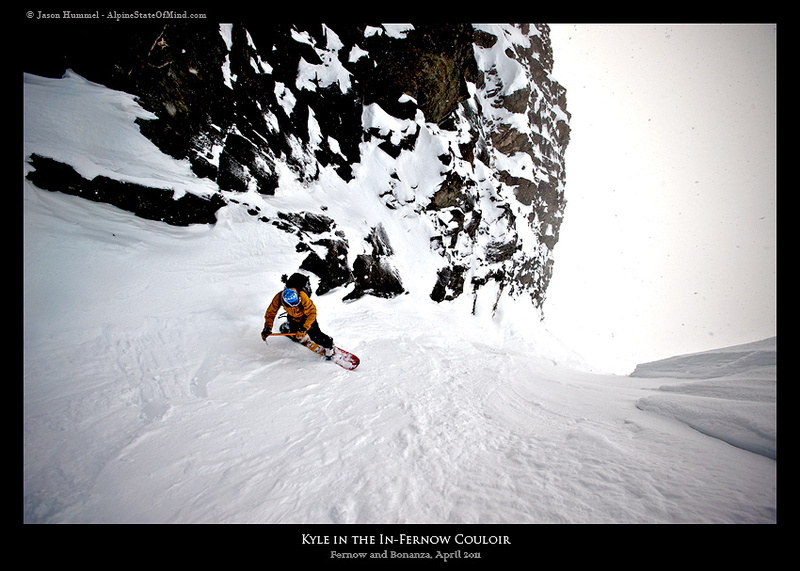 Thus, the In-Fernow Couloir it was christened. 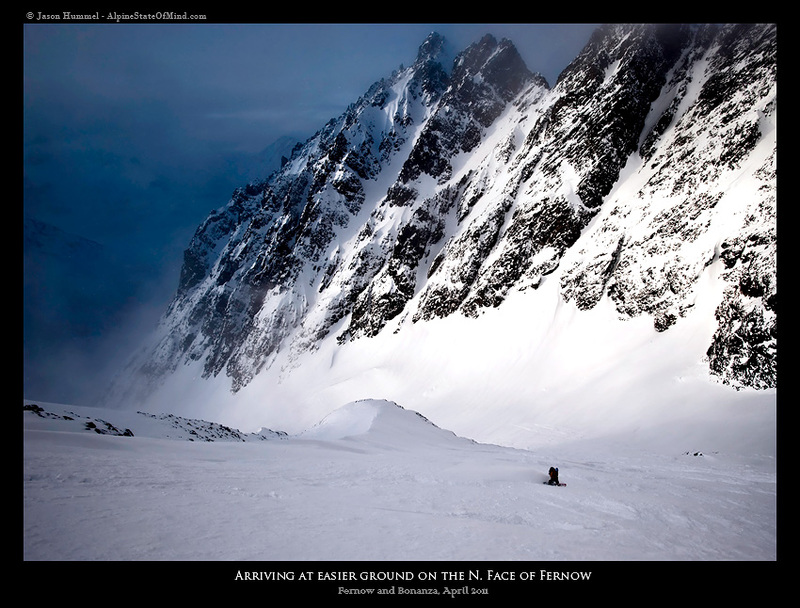 To our left couloirs lined the valley and the dormant bones of old avalanches wound from their bases. Out in the distance the clouds briefly, if only partially cleared for views into the ice and rock faces of nearby peaks. They appeared to be floating worlds, separate and dislocated from the Earth. Of course they weren't, but nonetheless, I was captured by the view and rung out every moment of it until the clouds converged and hid them once more from sight. 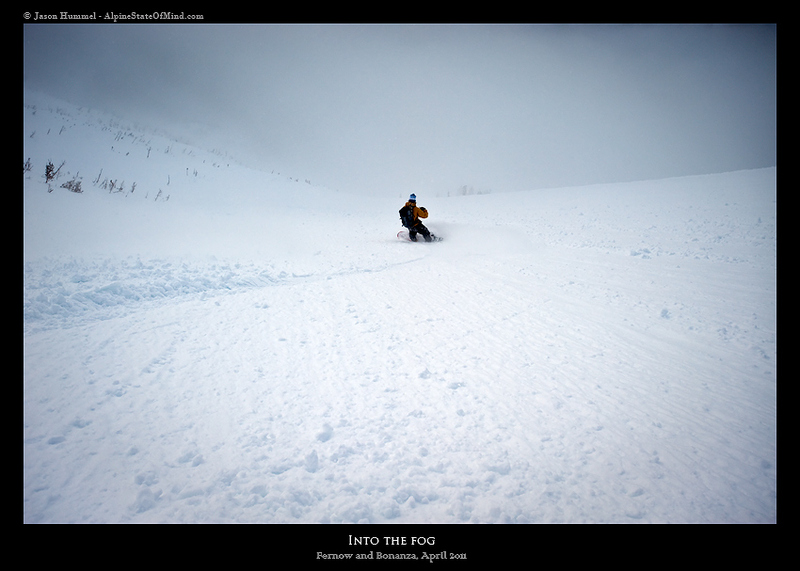 Skiing down the remaining 3000-ft felt like flying. In some way I think, a bird, if it had legs instead of wings would take up skiing to supplement his love of flying. As we dropped into the clouds snow began to fall and, eventually, we reached a tiny stream and the headwaters of Big Creek with legs screaming from the hundreds of turns we'd just made. Scooping up several liters of water helped salve the pain. We sat and drank as fast as the mind-numbingly cold water would allow us too. By then, darkness was marching in on us and we still had many miles to go down unfamiliar terrain. Since we had come up the east side of the mountain and descended the north side, our deproach would be different than our approach was. Eventually, hours later, with our flashlights illuminating the valley bottom, we would spot the lights of Holden Village. From there 2-3 miles seperated us from comfy beds and rest. After an amazing day in the mountains in less than optimal conditions, we were thrilled to have been given the tiniest of windows in conditions just good enough to allow us to do what we had come here to accomplish. That's an awesome feeling. 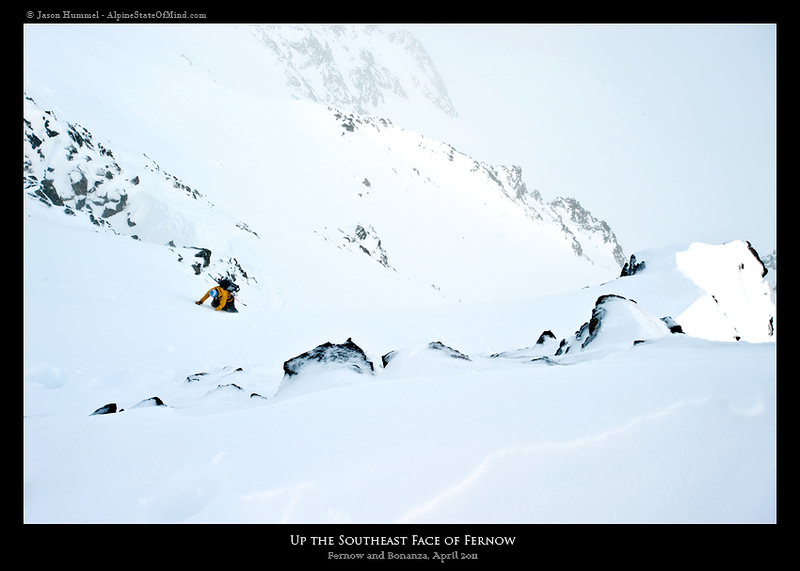 Two days later we would attempt to ski the Northeast Face of Bonanza Peak, the tallest non-volcano in Washington State. And that, my friends, would push our excitement and thrill to new levels. See part II (link below).